Pedigrees nof the MacNamara Family. The Pedigree of John MacNamara, Esquire, with some Family Reminisences. Republished by Martin Breen in 2006 with foreword by Peter Harbison. NOTE: if you do not wish to use Paypal you may purchase this CD set by sending a EURO cheque to OaC, Spanish Point Rd., Miltown Malbay, Co. Clare, Ireland. Your Book will be dispatched as soon as the funds have been cleared through our Bank account. The macNamara family had connections through marriage to many of the landed gentry of the day such as the Keanes of Beechpark and Hermitage, the Finucanes of Lifford, the Stamers of Carnelly, the Sarsfields of Doolin, and the O'Briens of Lemeneagh and Dromoland. The grand nieces of Frances Susan (MacNamara)-Twigge married notable personages of the 20th century. Nicolette MacNamara married the portrait artist, Anthony Devas. After his death she married Rupert Shephard, director of Capetown University's Art School. Nicolette's sister, Caitlín, married one of the great writers of our times, Dylan Thomas. The author of this book on the pedigree of the MacNamaras was Robert William Twigge. Born in Yorkshire in 1852, he was educated at St. Peter's College in that county and abroad. In 1879 he was elected a Fellow of the Society of Antiquaries, and about the same time he was appointed Privy Chamberlain of the Cloak and Sword to Pope Leo XIII. Twigge was a noted author of many works on family history and his papers appeared in the learned journals of the time, including 'The North Munster Journal'. For several years he was engaged on an important work on the history of the MacNamara family, and their territory of Clancuilein in east Clare. During this period he corresponded regularly with the noted historians and antiquarians of the day such as the great Thomas Johnson Westropp and George U. Macnamara. Sadly his untimely death in 1915 prevented the completion and publication of this great work, and although his notebooks still lie unedited in the British Museum, they are available on microfilm in the research section of the Clare Co. Library. This book was published as a precursor to his monumental work on the MacNamaras and was published in a limited edition for some of his close family relatives, and only a few copies are now known to be in existence. The book, which is a type of family tree, deals with the pedigree of the family, beginning about the 2nd century AD, and details many of the historical figures and personages down to the end of the 19th century. Also included are the MacNamaras of England, Wales and France. While much of the research was carried out using the various Annals, State Papers, Wills and from the vast amount of private papers which Twigge had amassed from his MacNamara in-laws, I have taken the liberty of adding some of his other unpublished material, some family trees, and the MacNamara Rental from 1390, in order to enhance the book and make it even more interesting to the reader. "The Macnamaras, (who spell their name in various ways), are a junior branch of the Irish Clann Cuilein, descendants of a king of Munster, and who played an important role in their native County Clare's history during the middle ages. Among their most famous family members were Maccon the Great, one of the victors at the Battle of Dysert O'Dea in 1318, and two who bore the name Síoda - one the builder of Bunratty Castle around 1450, and the other who got a raw deal when he submitted to king Henry VIII in 1543. During the following centuries, many Macnamaras left Ireland to earn fame as soldiers and naval men in France, or as gentlemen and politicians in Britain. 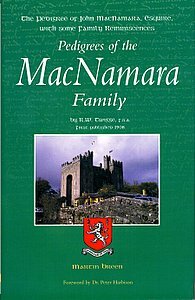 One of the latter was N.C. Macnamara of London, whose "Story of an Irish Sept" was re-published seven years ago by Martin Breen, who has now placed us further in his debt with the re-issue of this rare but cognate pedigree and extended family history of John Macnamara of London and Wales. Its author, R. W. Twigge, a frequent correspondent of the well-known Clare antiquary, George U. Macnamara, was an Englishman who clearly empathised with the tragic treatment of Ireland down the years, and who almost finished writing a history of the whole Clann Cuilein. The quality of this volume shows what a pity it is that he never succeeded in completing it to the point of publication." This new volume, which has taken quite a few months to prepare and has generated a good deal of interest from MacNamaras both at home and abroad, is finally available for purchase.